Cynthia Becker takes us on Chipeta’s journey of fighting for peace when hostility among whites and Utes was in full force in the mid to late 1800s. Settlers were moving in the Colorado Territory; expansion was apparent and flooding the area like a down pour in the desert. She married Chief Ouray and they set out to meet with President Lincoln and his men to urge peace concerning the Ute nation. Chipeta traveled around with Ouray (which was uncommon for Ute wives) and together they vied for peace with the President and other lawmakers. Chipeta passed away in 1924. She never wavered from her decision and beliefs about peace. Her dedication is an example for young Native girls today. Her story needs to be read by all young people in every school as Chipeta is a model of honor, devotion and loyalty. 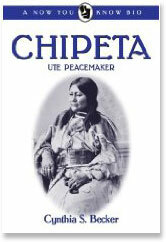 Chipeta: Ute Peacemaker is a biography filled with history, photographs, and facts. It is rich in Native American nobility. By Dr. Bill (William L.) Smith, April 15, 2010, Goodreads.com. Excellent read. Well researched and adapted to a younger reader audience. I really enjoyed the story and the history involved. This was a very quick read and very well balanced. Usually we read about Ouray, her husband, and there is not much information on Chipeta. I read this in conjunction with Evalyn Walsh McLean’s book about how her father made millions of dollars by mining in the very country that the Utes were driven from by the miners. Interesting to see the greed of the white man destroying the life of the Native Americans and the ultimate ruin of Evalyn as a result of too much money and no work ethic. Chipeta’s ability to cope in the face of the total destruction of her life as she knew it is an amazing story. Chipeta, Ute Peacemaker, is an intricately woven story of Chipeta, the wife of the Ute Chief, Ouray. Exceptionally researched, it makes the history of the Ute people and their relationship to the white community and Chipeta’s role in the history of these people accessible to middle grade students who need information for Colorado History reports, or reports on important women or on Native American studies. This book reads so well that it could also be a happy choice for the student who prefers nonfiction for their leisure reading. Becker has found the formula for making carefully documented research an interesting read for any age. This is a must have book for elementary and middle school libraries. It targets the middle grade students. See Chipeta, Queen of the Utes, by the same author, for an adult treatment of this topic in greater depth. Chipeta was the wife, confidant, and advisor to Chief Ouray of the Tabeguache band of Ute Indians in the mountain regions of Colorado. After Ouray’s death in 1880, Chipeta continued as a leader of her people through times of challenge and hardship until her death in 1924. Chipeta was respected as a wise woman by both Utes and non-Indian people. I have always been interested in The Native American Indians.So it seems that after reading the reviews from this book “Chiketa” I look forward to reading it myself.